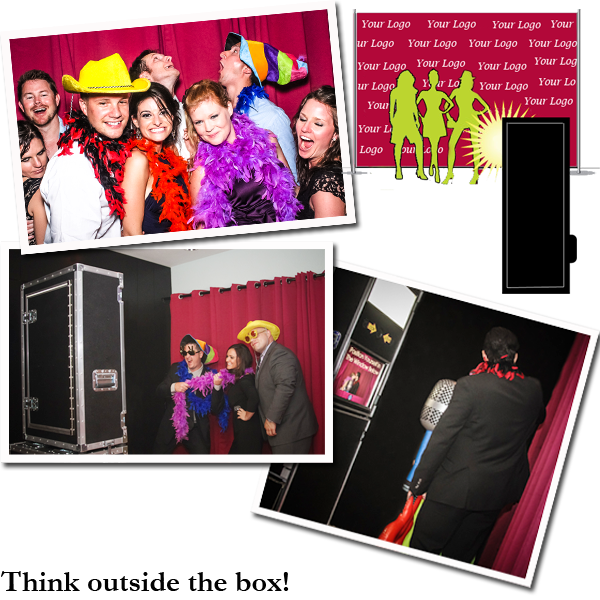 Photo Booth for Wedding: People love the idea of taking silly photos in a photo booth, but some have complained that the interior of a typical photo booth is small and cramped. At parties, most guests enjoy taking photos in large groups with friends and family. Hmm….What can we do? The Open-Air Party Booth is the latest iteration of the classic photo booth, and it’s popularity has exploded over the last couple of years. Essentially, it is a photo kiosk that measures 2 ft wide by 1 ft deep by 6 ft tall. This tower of fun has several attractive features: Since it is open with no side walls, it’s great for large group photos, accommodating from 1 to 15 people! The open style not only entertains those taking the photos but also everybody else watching! It’s compact size is perfect for where there is limited venue space or difficult access (e.g., on a balcony or an upper level with no elevator). It comes with a huge backdrop in your choice of colors We can also custom design a “Step & Repeat” backdrop with your names, monogram, or other graphic design.